From left to right: OHB System COO Andreas Lindenthal; MT Aerospacevice-president Roland Schneider; ILL director Dr Helmut Schober; ESRF Physical Sciences Research director Harald Reichert. 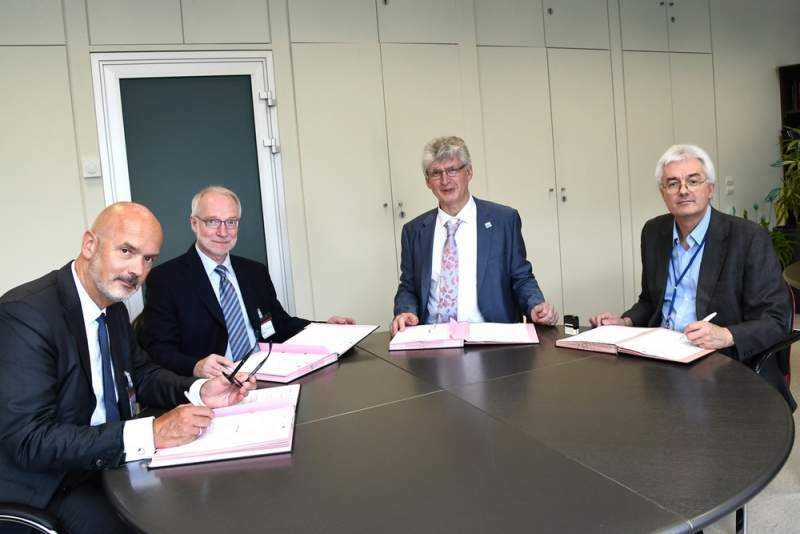 Credit: Serge Claisse / ILL.
France-based Institut Laue-Langevin (ILL) and its sister group European Synchrotron Radiation Facility (ESRF) have partnered with OHB System and MT Aerospace to develop technologies for the space industry. The companies involved have signed a memorandum of understanding to jointly establish a potential partnership to advance the characterisation of aerospace materials and make fabrication processes more efficient by probing matter with x-rays and neutrons. ILL director Helmut Schober said: “Europe operates the most powerful network of large scale materials characterisation facilities, among which the ESRF and ILL are the world-leading flagships for probing matter with X-rays and neutrons. “Employing these tools for the benefit of Europe’s space industry is an enormous opportunity to further develop Europe’s competitiveness in this technology sector. The partnership is expected to further advance the development of high-performance materials for space vehicle structures, propellant tanks and propulsion systems. It will also focus on the development of lightweight, deployable and inflatable structures for space infrastructures and crew habitats, and innovative systems to minimise the launch mass and volume of parts such as antennae and booms. The partnership will benefit from neutrons developed by ILL. The non-destructive neutrons can explore deep inside matter, and so can be used to probe for most materials. The high-energy non-destructive X-rays developed by ESRF are capable of penetrating deeply in large structures, providing atomic to micron-scale structural data using various techniques, including in-situ micro- and nano-computed tomography. Together the collaborators will conduct prototype manufacturing of new materials, progressing from multi-parameter studies through to qualifying models for testing and flight approval. The partnership will also provide OHB System and MT Aerospace access to a non-destructive investigation (NDI) tool that will allow the investigation of large complex parts, including brackets, valves or tank and structures as well as electronic components and circuit boards.